Trick-or-treating, classroom parties and candy as far as you can walk; it’s a kids dream. 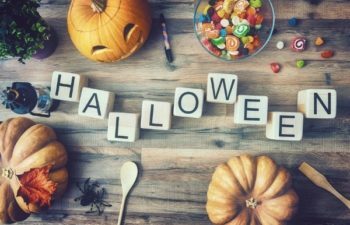 For parents however, Halloween fun can seem dangerous with children going up to strangers houses, large crowds clogging the sidewalks, and the sugar rush that leads to bad decisions present. Did you know children are more than twice as likely to be hit by a car and killed on Halloween than on any other day of the year? That’s why we have put together this list of safety tips to try to keep everyone’s Halloween spooky and safe. Fire-resistant. All costumes, wigs and accessories should be fire-resistant. There are lots of candles, jack-o-lanterns and excitement on Halloween. By making sure everything is fire-resistant there is another line of defense against an accident. No masks. Masks can obstruct vision and cause a safety concern while walking the neighborhood. Use reflective tape. If children are allowed out after dark, fasten reflective tape to their costumes and bags, or give them glow sticks so they can be easily seen by pedestrians and vehicles alike. Go nontoxic. When buying Halloween makeup, make sure it is nontoxic and always test it in a small area first before applying it. Stay in the light. Instruct children to travel only in familiar, well-lit areas and stick with their friends and chaperones. Remember, if you or a loved need legal assistance, Call Me on My Cell! Reach out at 813-254-7119 or visit www.CallMeOnMyCell.com!